CSAB SFTI Counselling 2017 (केंद्रीय सीट आवंटन बोर्ड स्व-वित्तपोषित तकनीकी संस्थान काउंसलिंग) is going to be conducted in the third week July by central seat allocation Board. CSAB SFTI Counselling Schedule is conducted for the admission in engineering courses in Self-financed Technical Institution (SFTI). The CSAB SFTI Counselling Procedure does not involve the conduction of any separate entrance exam but it considers the JEE Main 2017 Score Card for taking admission in SFTI. CSAB is a counselling board made up by National Institution of Technology, Patna (NIT, Patna). There are in total 34 institutions which come under Self- financed Technical Institution (SFTI). At the end of the counselling, the applicant would definitely get a confirmed seat Through CSAB SFTI Counselling Seat Allotment Procedure. The counselling will be held after the successful completion of Joint Seat Allocation Authority Counselling (JoSAA 2017). 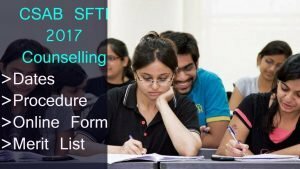 In accordance with the AIR of JEE Main 2017, the applicant will be allotted a confirmed seat in one of the institution of SFTI through CSAB SFTI Seat Allotment List 2017 We are providing you with the detailed information about CSAB SFTI Counselling Application Form, Eligibility, dates and much more on this blog. To know about all these details you can scroll down the page. The applicant who has qualified JEE Main 2017 with minimum cut off marks will be eligible for CSAB SFTI Admission Counselling. The applicants have to pay the counselling fee and then withing 6 hours they are required to fill the application form, lock choices and verify documents. Later the core team of the board will release CSAB SFTI Counselling Seat Allotment Result 2017 thereafter the applicants would need to report to the allotted centre and join the class after paying admission fee. Registration Fee: Rs. 1000/- for all candidates. The applicants are required to select the name of the institute from the available choices of 34 institutions and lock them. After this only they will be provided with a confirmed seat in one of the colleges as per their rank in JEE Main 2017. All the applicants who are applying for CSAB SFTI Counselling 2017 will have to bring their academic and personal documents for the verification purpose. CSAB SFTI Counselling Merit List will be released on the official website of Central Seat Allocation Board @csab.nic.in. It is expected that the merit list will be released in the first week of August 2017. We will also release the same after it gets announced on the official website. To know more about such Latest B.Tech Counselling Admissions you can click on this link.